You don’t need us or any outsider to kick the tires of your plant operating system. You can do that on your own. But please read on if you would benefit from knowing (not guessing) how to make more parts that meet all requirements, with the least amount of cost and effort. We offer a one-day Plant Operating System ‘health-check’… A structured, focused assessment that gives you and your leadership team valuable guidance to help you improve what you do, while reducing efforts and costs of manufacturing operations. Many clients and their suppliers benefit from this structured assessment or “Health Check” which evaluates how people work together (or not), Internal Audits, CA/PA and Management Review processes. The premise is that when you do a good job at those elements, everything else falls into place. We bring a fresh set of eyes and provide coaching, while on-site, to the responsible folks and top leadership to use those elements to make your Operation more profitable — and improve customer satisfaction. Deliverables of this Health Check include a summary report with a SWOT analysis (Strengths, Weaknesses, Opportunities and Threats) related to your Plant Operating System. The key to competitiveness and profitability is Prevention. Some of our clients invite us back every year for a diagnostic and prescription to be healthier. Just like an annual physical examination, it could be for reassurance, to catch a problem before it becomes serious, or to begin treatment of a persistent problem. 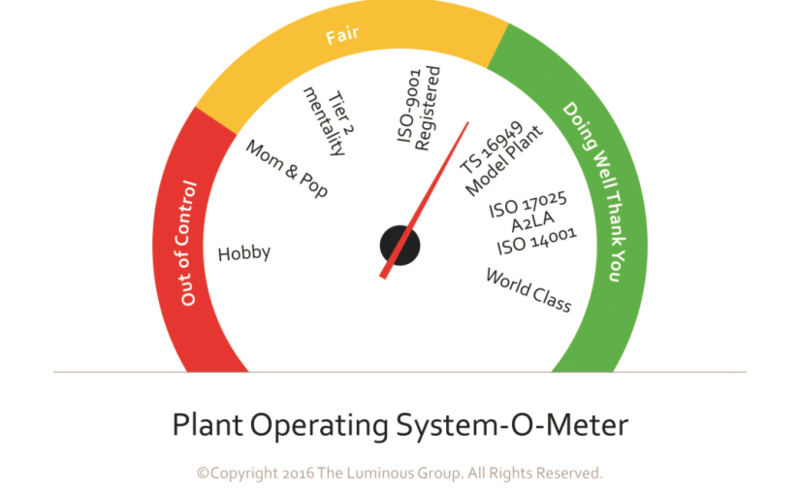 If you’d like to know more about a health check for your plant or suppliers, please contact us at info@luminousgroup.com.